Close to 300 drivers representing every State of Australia, along with New Zealand, Singapore, Italy and Sri Lanka, will be in action at the event. 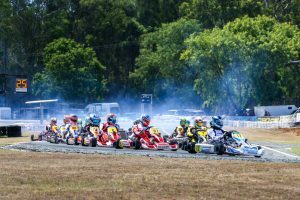 It will be the largest national karting event in Newcastle in almost 20 years. Fresh from a victory at the opening round last month in his home state, Queenslander Troy Loeskow will start as the favourite in the elite KZ2 gearbox class. 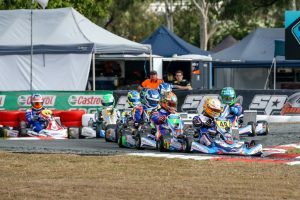 The Ricciardo Kart driver has enjoyed success at the Newcastle circuit in the past with victory in the opening round of the 2017 Championship. Loeskow will face tough opposition from fellow Queenslanders Chris Hays and Jason Faint, both who have shown strong speed around the tricky Newcastle layout previously. Garry Rogers Motorsport Supercars driver James Golding set the pace during qualifying at the opening round before finished sixth in the final. He will be one to watch this weekend. Sydney-sider Pierce Lehane will be out to make amends for a disappointing finish to his opening round campaign in the highly-competitive X30 class. After battling with eventual winner Brad Jenner and podium finishers Cameron Longmore and Jaiden Pope for the majority of the weekend, Lehane failed to finish the final at round one. Lehane won the corresponding round last year and has also previously stood on top of the podium as a junior competitor in Newcastle back in 2010. Drivers as young as seven will line up in the Cadet 9 class. For these youngsters, the thrill of success on the track is exciting, while they learn valuable driving techniques well before they are old enough to obtain their road licence. Gold Coaster Patty Buckley was victorious in the opening round and in doing so ensured that the Buckley family were the first to have two generations of the one family victorious in a round of the multi-round Australian Championship. In the elite Junior category, Queenslander Luke Pink dominated the opening round taking a clean sweep of proceedings. Victorian Fletcher Harris sits second in the standings entering round two, a mere two points clear of Beau Pronesti. Teams and Competitors will begin arriving for the event tomorrow ahead of practice on Friday. Qualifying and the heat races will be contested on Saturday from 8am before the drivers line up for the finals that begin on late Sunday morning.